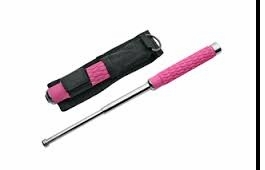 This pretty pink baton is a real self defense weapon. We have two models the steel shaft has a shiny chrome finish on one and a solid black finish on the other. Both models are 6.75 inches long baton when closed and expand to 16 inches with the flick of a wrist. The raised diamond design on the rubber grip makes it easier to hang on to in an altercation. This model of collapsible baton weighs 13.5 oz. The chrome comes with a black nylon holster with tiedown loop. The black has a pink holster. The retention clip fixed to end cap is adjustable if you need to make it easier or harder to open and close. We have a video illustrating how to make adjustments if necessary. These are usually good right our of the box. It just takes a few open and close cycles to lose the new stiffness. Cannot ship to MA, NY or CA.